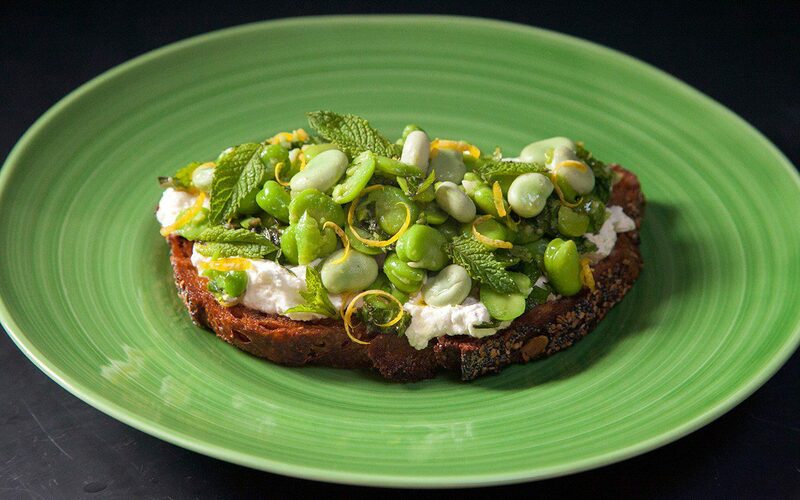 Broad bean, mint & ricotta bruschetta – Dig Delve – An online magazine about gardens, landscape, growing & making. 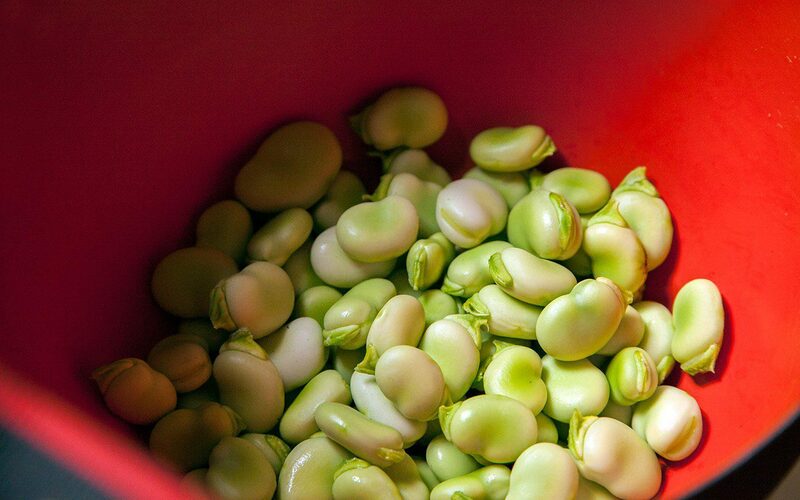 Broad beans (Vicia faba) are a kitchen garden staple for us and, gratifyingly, one of the easiest crops to grow. Every year we make an autumn sowing from October to early November, depending on the weather. If sown early in a warm autumn they can grow too large before winter and are then susceptible to wind rock, frost or snow. If sown too late in a cold, wet autumn there is not be enough time for them to get away before winter descends. 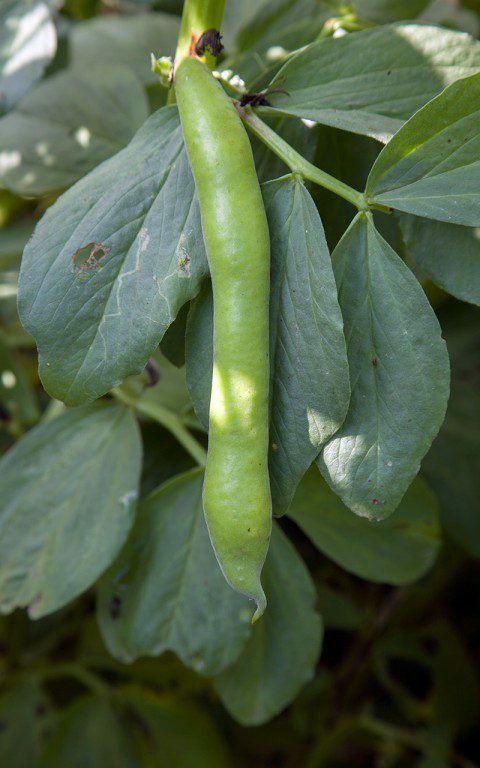 Autumn sown beans are less prone to black-fly, produce stockier plants and an earlier crop of beans. In a warm spring this is sometimes as early as mid-May. Our first harvest this year was in early June, but we also made a spring sowing of beans in 9cm pots in early March, which were brought on in the cold frame and planted out in April. These plants are starting to crop now, just as we have taken the last of the beans from the winter sown plants. In a good year this means that we can have beans from mid-May until mid-July. In our experience spring sown plants tend to be leggier and less productive, so it is worth choosing shorter-growing varieties as the taller ones will need staking. We habitually sow Super Aquadulce in winter and Hangdown Green in spring. As soon as the beans are finished you should cut off the growth above ground, but leave the roots in the soil as they fix nitrogen. Replant with later summer leaf vegetables which thrive on the nitrogen, such as salad or chard. At this crossover point from the winter to spring sown beans we often end up with a mixed harvest of large and medium sized beans, with their tougher, more bitter skins, and very small, sweet beans which can be eaten straight from the pod. If so I will cook them in two batches, cooking the larger beans for 3 minutes and just blanching the smaller ones for a minute. This is such a simple recipe and one I return to every year in some shape or form. Who doesn’t like fresh garden vegetables on toast ? 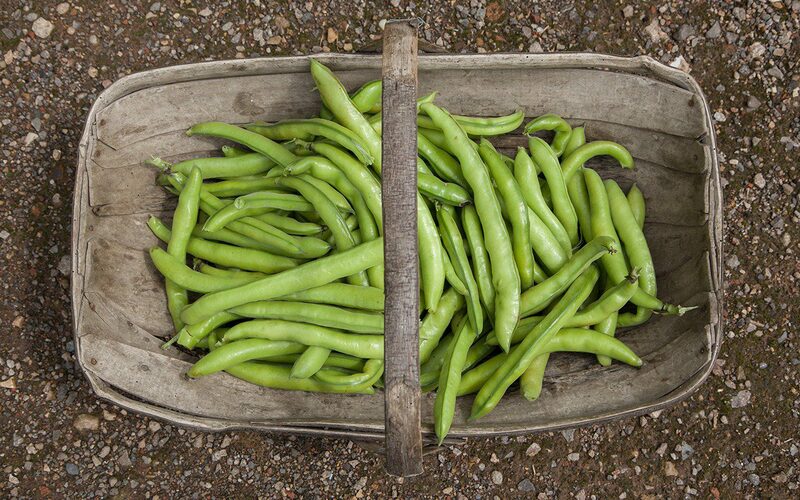 It is extremely adaptable and, as the season progresses the broad beans can be replaced with peas, chargrilled courgettes, roasted young beetroot or carrots, wilted chard, chargrilled chicory or blanched french beans. The herb can be substituted with others as available and appropriate – dill, fennel, chervil, basil or parsley. If you can’t find ricotta substitute with goat or sheep’s curd, or a soft young goat’s cheese. Bring a pan of water to the boil. Cook the beans in batches for 1 – 3 minutes, depending on size. Drain and put into a bowl of cold water to refresh. Drain again. Remove the large and medium beans from their skins – the very smallest can be left with their skins on – and put into a bowl with the mint, half the lemon zest, the lemon juice and two tablespoons of olive oil. Season to taste and stir. Season the ricotta with salt and pepper to taste. Drizzle or brush olive oil onto both sides of the sourdough bread. Grill each side until well browned with some light charring. Alternatively bake in a hot oven (200°C) for 8 to 10 minutes, turning them over at the half way point. When done and while still hot, rub the upper side of each slice of toast with the clove of garlic. Spread half of the ricotta on each slice of toast. Spoon on the broad beans. Finish with the reserved mint leaves, the remaining lemon zest and a drizzle of olive oil.